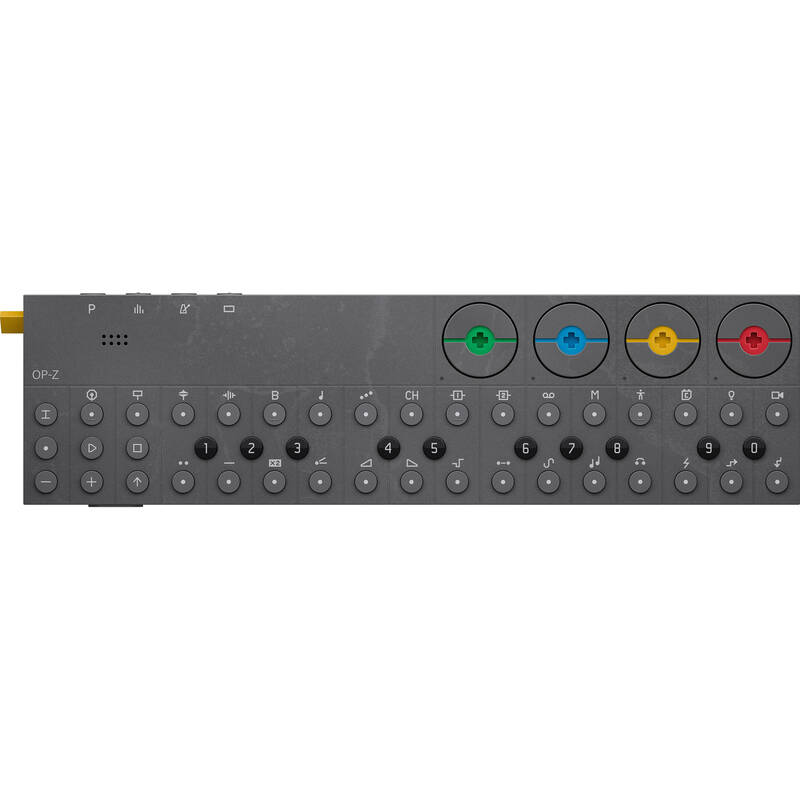 Building upon the success of the OP-1, the Teenage Engineering OP-Z is a portable all-in-one synthesizer and 16-track multimedia sequencer. The device can not only produce complete music tracks and sound effects, but is also capable of MIDI, CV, & trigger track sequencing, image & 3D graphic sequencing, and DMX light sequencing. All 16 tracks can run independently, allowing for individual track speed and length. What's more, each step of the sequencer offers component sequencing, which adds variations per cycle, note variations, micro-sequencing, direction, parameter changes, re-triggers, and more. There are 14 different components, and each has 10 values and behavior programs, which totals 140 ways to alter a single step. All keys are backlit with multicolor LEDs with instant machine feedback, a convenient feature for dark stages and poorly lit environments. Even the print on the unit uses a special glow-in-the-dark paint to keep you on point during a performance. There is no built-in LED screen. 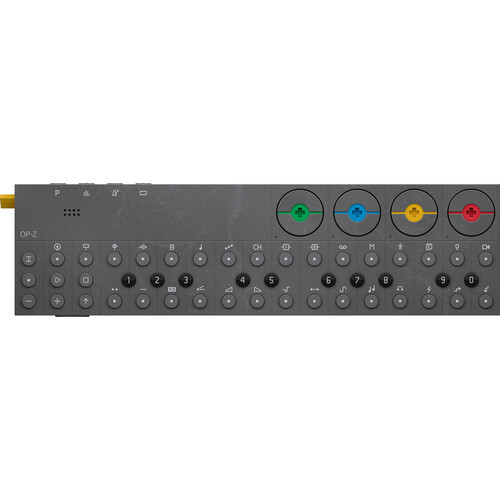 Instead, the OP-Z connects to your iOS device and takes advantage of its high-resolution retina display. A free iOS application pairs the two devices and further expands the feature set. Photomatic allows you to capture and arrange photographs into synchronized stop-motion photography with effects or import custom graphics and animate them in pace with your music. Media can easily be imported into the system via Dropbox. To eliminate any latency between image and sound, the OP-Z sound engine is ported to run simultaneously on your iOS device, which enables dual-domain synthesis. Box Dimensions (LxWxH) 9.1 x 2.9 x 1.0"
OP-Z Synthesizer and Multimedia Sequencer is rated 5.0 out of 5 by 2. Rated 5 out of 5 by Craig from Tiny box of wonders Got this based on my experience with the TE Op-1, a modern classic. The Z is smaller, more powerful, and a distinctly different instrument to the OP-1. The emphasis here is on performance, and the influence of the Pocket Operators is strong on this. Theres a lot of options and control behind an interface that has a bit of a learning curve. Bear through it, it pays off! The integration to do light controls and Unity to do visuals on an iPhone or iPad is a game changer. Its easy to connect and is the ultimate tool to impress at a house party (sadly no longer in my repertoire). Its pricey and doesnt compare with synths in its price category for synth editing and sound creation, as its really a category of its own. The sequencing, sampling, sound engines, etc. all together makes it the ultimate musical tinker tool on the airplane, tour bus, backwoods -- wherever. If history is any indicator, TE will invest in lots of updates that will continue to unlock functionality over time, which is like getting a new instrument every few months. Recommend buying one - put the future of synth workstations in your pocket! Does anybody knows about the expected release date and price?